For many people, thinking about the end of life is difficult. Others cope by tackling those issues head-on and planning out every detail. If you or your loved one has Alzheimer’s or another type of dementia, end-of-life issues may feel even more complicated. What Are My Choices Regarding Code Status? If your loved one is admitted to a hospital or nursing home, you'll likely need to complete paperwork on what kind of medical care you want him to receive. 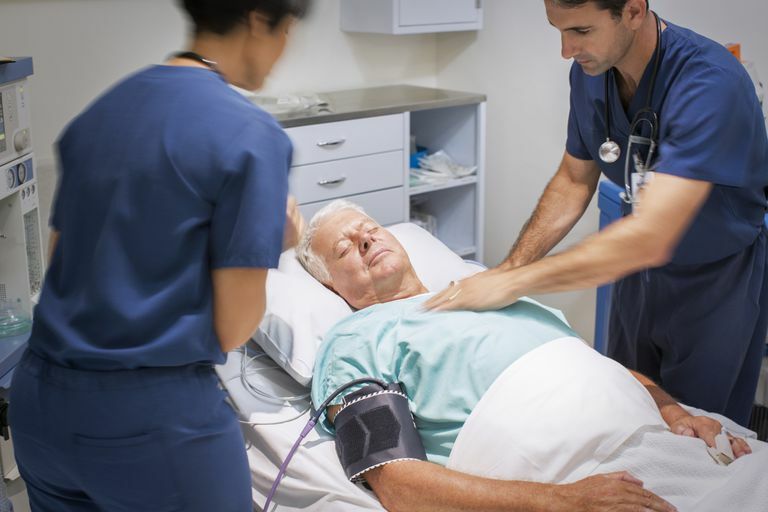 Among other questions, you may be asked about his "code status": if he wants to receive Cardiopulmonary Resuscitation (CPR) in the event that he experiences cardiac arrest or stops breathing, or if he wants to have a Do Not Resuscitate (DNR) order. A DNR order is a directive written by the physician per the wishes of the patient or the patient's designated medical power of attorney, telling medical personnel NOT to initiate CPR on that person. This depends on the health and age of the person receiving it, as well as the medical situation that caused her to require CPR. Less than five percent of the elderly or chronically ill survive after receiving CPR, and out of that five percent, most do not return to their prior level of functioning. In fact, according to a literature review conducted by Dr. Ladislav Volice and shared on the Alzheimer's Association website, "Cardiopulmonary resuscitation (CPR) is three times less likely to be successful in a person with dementia than in one who is cognitively intact. Those who initially survive are taken to an intensive care unit, where most die within 24 hours." Why Might Family Members Choose CPR for a Loved One with Alzheimer&apos;s? Some people choose CPR because they feel that it would be the preference of the patient if he could express his wishes. According to research, others may be influenced by watching CPR and its purported effectiveness on television, and then assume the same is true in real life. Still, others might be feeling guilt or grief, and are not ready to cope with the possibility of losing their loved one. Regardless of the reason, the goal of most medical facilities is to do everything possible in order to respect and honor the patient's wishes regarding his or her care. Some people choose to have a DNR order because they don’t want their loved one to end up connected to a machine for an extended amount of time if they have no chance of recovering or to go through the trauma of CPR with little or no chance of survival. The default of medical personnel is to treat everyone as a full code, meaning that they will receive aggressive medical care, including any life-saving and life-prolonging interventions available, unless they have a DNR order. If you have chosen to have a DNR order for yourself, remember that, although making this decision is a very personal process, it should not be a private choice. You should discuss this with your family and your physician so that they are clear on your decision. You should also keep copies of a DNR order with you in case you have a medical problem. Does a DNR Order Equate to Euthanasia? It is important to understand that choosing to have a DNR order is not the same as wanting to die. Rather, it allows a natural progression as a person passes away. According to the American Medical Association, "There is a strong general consensus that withdrawal or withholding of treatment is a decision that allows the disease to progress on its natural course—it is not a decision to seek death and end life. Euthanasia actively seeks to end the patient's life." Some people with early-stage dementia are able to clearly express their wishes regarding their resuscitation status. This is ideal because family members are not placed in a difficult situation of trying to discern what the patient would want; rather, the patient can make this decision and complete paperwork so that her wishes will be carried out. If your family member has dementia that has progressed into the middle or later stages, she may not be able to adequately communicate or understand this kind of decision now. If she has previously indicated her choices on a living will or other medical paperwork, that can be extremely helpful at this time. If there is no document where she has previously expressed her wishes, family members are left to make those decisions. Who Makes Decisions if Family Members Disagree With Each Other? This depends on the policies in your state and in the hospital or facility where you are receiving care. Ideally, family members can set aside differences and arrive at an agreement on what their loved one would have wanted for his medical care. If that can't happen, many healthcare institutions outline an order of decision-makers, such as first a spouse, then an adult child, a parent, sibling, etc. Others may utilize an ethics review board to discuss medical care decisions if there is no clear decision-maker designated. Alzheimer's Association. End-of-life Care for People with Dementia in Residential Care Settings. Ladislav Volicer, M.D., Ph.D. School of Aging Studies, University of South Florida, Tampa, FL. Alzheimer's Association. End-of-Life Decisions; Honoring the Wishes of the Person with Alzheimer's Disease. Medical College of Wisconsin. Discussing DNR Orders-Part 2, 2nd ed. No Shame: Why Do We Whisper About an Alzheimer's Diagnosis? How Can You Improve Quality of Life for Someone Who Has Alzheimer's?